Tom Heal and Lee Colvin avoided a remote area in southern Utah hauntingly named Carcass Wash for 27 years, wanting to leave painful memories of a horrible accident unturned in the desert sand. 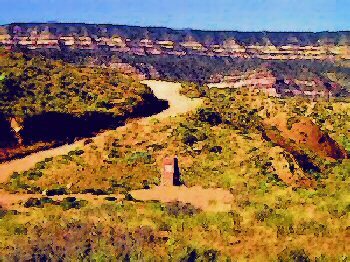 Still, on a warm Easter weekend three years ago, the childhood friends found themselves bounding on a dirt road paralleling the red and yellow brilliance of the Kaiparowits Plateau, Garfield County. They knew the wash was somewhere along the path but weren't sure whether they'd recognize it. 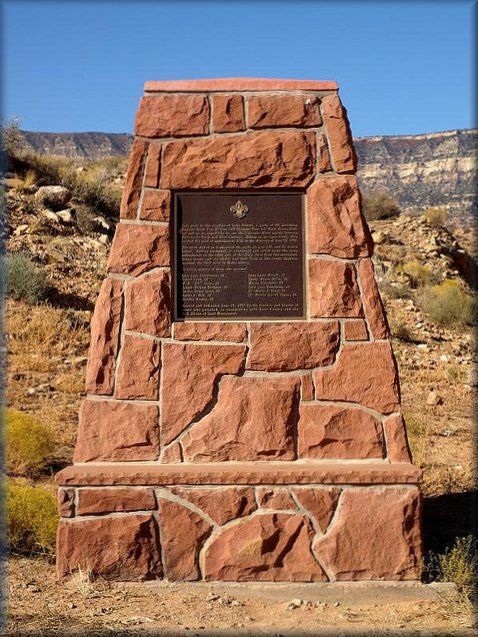 When Heal and Colvin last traveled the bumpy road June 10, 1963, in the back of a cattle truck teeming with rollicking Boy Scouts and leaders, their destination was Hole-in-the-Rock, 62 miles southeast of Escalante, Kane County. The historic Mormon pioneer crossing was to be the starting point for an expedition on a stretch of the Colorado River that would soon be immersed in Lake Powell. "We were really excited to be among the last people to ever see it," Colvin said. But the truck never made it that far. It failed to climb a steep hill and overturned at Carcass Wash, killing seven Boy Scouts from Provo Explorer Post 36 and six adults. Twenty-six others were injured. Ten more escaped the wreckage unscathed. On their return trip, Heal and Colvin instantly recognized the accident site. "There wasn't a rock out of place," Colvin said. They recalled standing on the road overlooking the wash.
"It was as though there was a time lapse. As we stood there, I could hear the brakes squealing. I could hear the gears grinding. I could feel the dust blowing in my face," Heal said. "It wasn't just a negative experience. It was positive, too. One would think that it would bring back all the horror of the experience. It did that. But it brought back a lot of fond memories also." Heal and Colvin spent a couple of hours at Carcass Wash that spring day piecing together repressed details. During their reminiscing, they committed to someday erect a monument to their friends who died. For three years they solicited donations. Nearly every survivor and family of an accident victim contributed. Their idea became a reality on two weekends this spring. Colvin laid the foundation in April. Stone mason Ken Jorgensen, whom Heal and Colvin hired, built the marker in May. "People who camp down there have no idea something significant happened years ago," Colvin said. "Maybe they can just stop for a moment and think about their own lives. A lot of good people left the planet right there." JUST PRIOR TO THE CREATION of Lake Powell, a party of 49, including Explorer Scout Post 36 from LDS Pleasant View 3rd Ward, Provo, Utah, set out on an expedition to run the Colorado River rapids between Hole-in-the-Rock and Glen Canyon. Riding in an open truck, they reached this point at approximately 3:15 on the afternoon of June 10, 1963. The truck stalled as it ascended the grade on your left, and its brakes failed. Rolling backward, it overturned and rolled down the steep embankment on the other side of the sharp curve from this monument. Seven scouts and six adults lost their lives in this tragic highway accident, the third worst in Utah's history. The monument will be dedicated on the accident's 30th anniversary June 10, 1993, at 3 p.m., the approximate time of the accident. Heal knows the hour because one of the 46 people sitting on tons of camping and rafting gear in the back of the 2 1/2-ton cattle truck asked him the time as the truck sputtered to a momentary halt on a hill it would never climb. Most of the boys on board were members of the Provo Explorer post sponsored by the Pleasant View Ward, East Sharon Stake, of the LDS Church. The adults were Scout leaders, fathers, guides for Socotwa School Expeditions, a Deseret News reporter and others who'd hitched a ride. The boys and their leaders traveled from Provo to Escalante by bus. Expedition leaders decided the bus couldn't handle the unpaved road to Hole-in-the-Rock, so they loaded all the provisions into the cattle truck. About 13 miles from the group's destination, truck driver Ernest S. Ahlborn, a 21-year-old Brigham Young University student, rounded a horseshoe bend and began ascending an 8 percent grade. "I vividly remember the truck not being able to make it up the hill. I remember him grinding the gears trying to get into a low gear," Heal said. The clutch never engaged, the truck stalled and went into a reverse roll. The brakes, later found to lack fluid in the master cylinder, didn't catch. The truck rolled backward 124 feet before tumbling over a 35-foot embankment, spilling people and gear into a gulch. Many were trapped beneath the heavy truck and its cargo. Some victims remember boys crying for someone to kill them because of excruciating pain. Ron Clark lay under the mangled gas tank, which leaked fluid over his clothes. Clark suffered dislocated vertebrae, a twisted leg and broken jaw. He knocked the jaw back into place with a right cross and waited for medical help, never losing consciousness. Help wouldn't come for hours. "I kept asking myself `why, why, why,' "Clark said. "The first prayer I offered in a long time was under that truck." Heal heard Kilmer Roundy, a father accompanying his son on the trip, yell "We're going down," and tried to leap off the hurtling truck but caught his foot in some camping gear. "So, I went down with it." "All I know is the truck was on top of me. I could see light out," Heal said. He wriggled out from under tons of gear and passed out. "When I woke up, he (Kilmer Roundy) gave me a canteen and told me and Brian (Roundy) to go for help," Heal said. 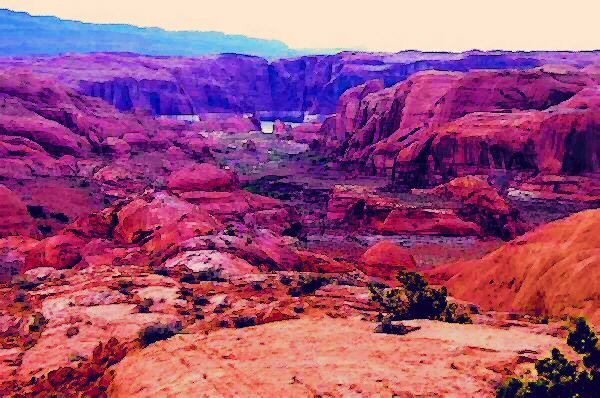 The two boys began walking the dirt road back to Escalante. Heal, who had broken ribs, said he expected to walk the 47 miles to the town. But two miles down the road, he and Roundy ran into a rancher who drove them to Escalante. Colvin was riding on top of the cab with two other boys, one of whom jumped and was crushed to death under a wheel of the rolling truck. The truck landed upside down on Colvin, crushing his right foot between a rock and a steel case full of gear. Amputation appeared imminent, but doctors at the scene didn't have the tools. Colvin's foot hasn't grown since. Nobody knows how many hours it took to get medical help to the injured boys and adults. Heal estimated it was at least four hours before people and police from Escalante and surrounding areas made it to the accident site. Rescuers began removing those pinned under the truck one by one. They jacked up one side of the truck, stacked flat rocks under it and moved the jack to the other side to do the same thing. They came to a point where the precariously perched truck would topple if cranked up any higher. Only Colvin and Clark remained underneath, lying cater-cornered from each other. Elevating Colvin's side would surely crush Clark. Elevating Clark's side would surely crush Colvin. Rescuers informed the conscious teenagers of the dilemma. Each told them to save the other. Both said they grabbed a handful of red desert sand and waited for the truck to shift on top of them. It never did. It was hours after the accident before all the injured were transported to Panguitch Hospital by people from nearby towns. The hospital had no ambulances. No one involved in the accident has forgotten it. "I recall the day as if it was just last Monday," said Clark, now hosting coordinator at BYU. "Something physically or emotionally reminds me of it daily." Clark, 45, said watching his oldest son go through the Scout program emotionally drained him. "When I saw his bedroll and backpack in the living room ready to go, I had this sinking, sinking feeling," he said. "I had a nervous anticipation until he got home." Roger Sheffield recalls the accident with sadness. "Maybe there was a loss of innocence with that, to realize how life is so fragile." He remembers waiting for help at the scene and lying on a hospital bed next to a boy who died. "I'm sure it was years before I stopped thinking about it every day. But it's faded into the past now," he said. Still, Sheffield, 44, said he wonders about the guy in the next bed. Now a general surgeon, Sheffield has numerous opportunities to save lives. "My parents always told me that's when I decided to be a physician," he said. Sheffield doesn't remember if that's true but said it makes a good story. Several of the survivors live with pent-up feelings of anguish and guilt. Today, psychologists would be called in to talk with the survivors. Support groups might be arranged. Thirty years ago, emotional wounds were turned over to Father Time. "We had the funeral and it was over. We put it behind us and nobody talked about it anymore," Heal said. "We were 15 years old at the time, and we were just left to figure out how to deal with it." Although his disabled right foot is a constant reminder of the accident, Colvin doesn't let it gnaw at him. "I don't reflect back and think, `Gee, if I didn't go on that trip, this wouldn't have happened.' It was just an accident." A Salt Lake County property manager, Colvin enjoys the outdoors, especially motorcycle riding. "I refuse to be limited." Kilmer Roundy, 67, now retired and living in Washington, Utah, said the accident didn't change his outlook or the course of his life. "It kind of haunts you, but you can't let it dominate your life," he said. But he still questions one thing. "I wonder why did a group of adults let a load like that in the back of an open truck?" That question still rests heavy on the minds of a couple of the adults who went on or helped plan the trip. Both declined to be interviewed, but in brief comments expressed extreme sorrow. "Why didn't I keep those wonderful young men home?" said one. The other doesn't want to relive the past or see a monument erected. "I hope this commemoration doesn't become a second funeral. I don't want any eulogies. We don't want people to be saddened by this experience," he said. BY High student Gordon Grow died at this place.